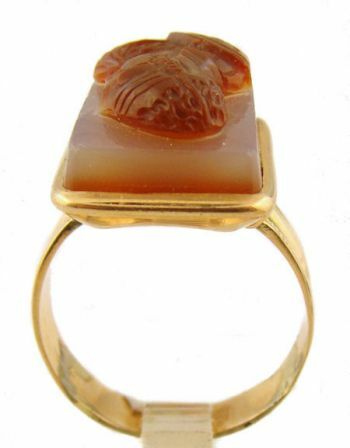 Description: 10k rose gold banded onyx cameo ring. 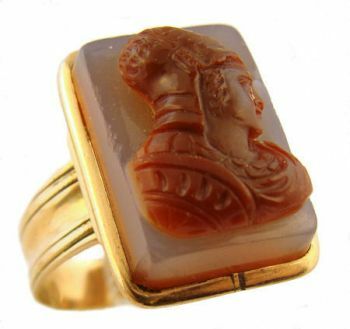 The 17 x 12 mm cameo is carved from (banded agate) sardonyx and white onyx depicting a Roman soldier or warrior. 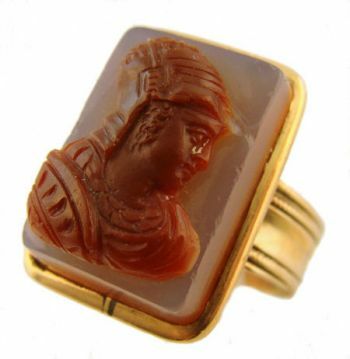 The cameo stands out in high relief and is framed in a plain 14k gold bezel setting on a 6.0 mm wide flat band. Unmarked but electronically tests 10k. Circa 1870's. Measurements: The ring top measures 3/4" x 1/2". Ring size 7 1/2. Enlarging ring will leave a yellow gold section on the back of the band. Condition: Good. On the cameo the helmet's brim is chipped off which is only noticeable under magnification. On the setting the bottom half of shank has been replaced and the solder joints appear to have been done in sterling or white gold. 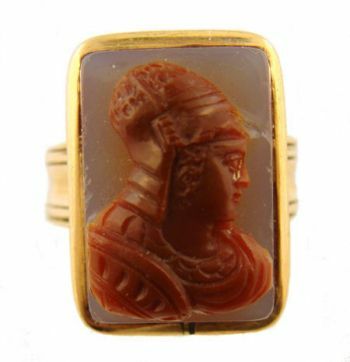 Also there is a split or repair line at the bezel on the bottom of the cameo. Shipping time: With in 1 to 3 days or an additional week if sizing is requested.